If I was lucky enough to live in New York, I would do almost anything to stay in the city, including squeezing my kids into a tiny space. That is exactly what this mum has done, and with New York style to boot! Mum Lauren and her husband decided that their two children, Brody, 4 and Harper, 2, needed their tiny room revamped now that they are ‘big kids’. The result is simply stunning. Urban chic, yet cosy and welcoming, you would never imagine that the room is just 4.9 square metres! All the key pieces of furniture in the room are from IKEA, including a very awesome IKEA Hack (literally!) of the MYDAL bunk bed, which was custom shortened and painted white. I wish I had known this was a possibility when we were figuring out whether we could squeeze a third child into our tiny inner city terrace! It took several months to curate every piece in the space, with endless online research, hours on Pinterest and Etsy, and many shopping ventures both in and out of the city. We can finally say the project is complete and just in time to kick off the new school year. The room is modern, fun and includes urban-inspired accents to pay homage to the city we love so much. 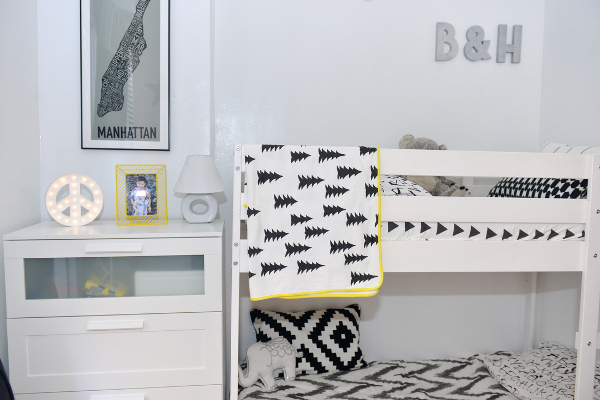 The black and white colour scheme is perfect for a room being shared by a boy and a girl, and although the colours are the same, Lauren wanted the bedding to match her kids’ personalities and meet their approval without being too sophisticated or modern. I went with West Elm’s Organic Chevron Duvet Cover in Slate for Harper’s lower bunk, with simple white sheeting and added Brody’s IKEA pillowcase to juxtapose the chevron. For Brody’s top bunk, I found the EIVOR ORD duvet cover and pillowcase at IKEA, which earned his approval in white with a black alphabet print. There are some wonderful pops of colour in this room, in accessories and wall art. 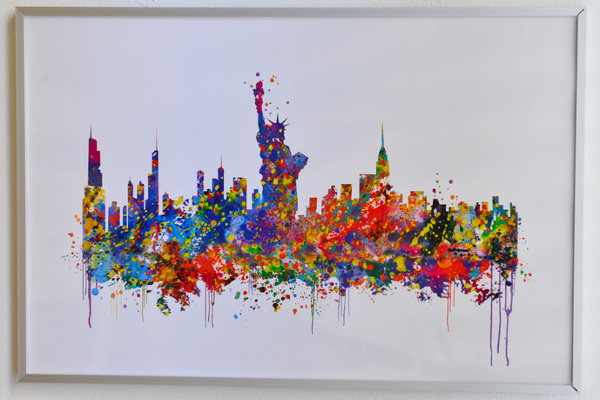 I just love the rainbow print of the Manhattan skyline. I fell in love with an artist I found on Etsy, whose shop is named CocoMilla. I chose a panoramic water color of the New York City skyline and it turned out beautifully against the white wall in a simple, silver frame. Another tie-in of the city is the framed Manhattan Typography Map. I saw it in the window of a gallery and thought it would work perfectly in the narrow, yet tall space above the tall dresser. I liked that it paid tribute to our city and the grey also complemented the monochromatic mood of the room.